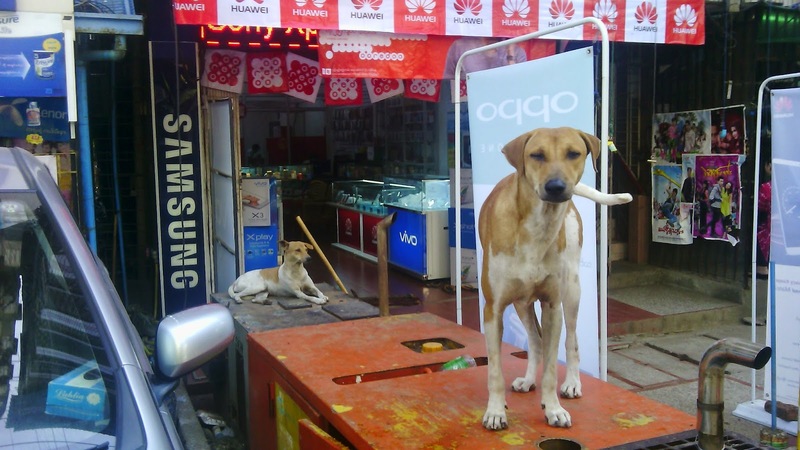 These two dogs live on the auxiliary power plant of the mobile phone store next door. Few people notice or interact with them, but nobody seems to harbor them ill will. As with most dogs in my environs, they are ignored and, by and large, they ignore the people around them. Somebody who knows as little as I do about Myanmar, suggested that the reincarnation thinking of Buddhism contributes to the easy co-existence of so many people and stray dogs in my busy little street. The dogs of my street do have a social life amongst themselves. It feels a bit like the jets and the sharks, each small pack controlling a couple of meters of Shan Kone street. The packs become more active after the market shuts down and the street quiets down around 10 or 10:30 pm. A sudden yelp in the night is common, as is the communal howling at whatever. I would say that my street has some 15 or 20 stray dogs. They all tend towards a single beiges brown appearance. Different streets have marginally different colour schemes, reflecting, I would think, the dominant male’s genes. You have to think that the lack of the watchful eye of the Myanmar Kennel Club, many of them are interrelated in complicated ways. The females especially can look worse for wear after a continuous cycle of pregnancies and babies. 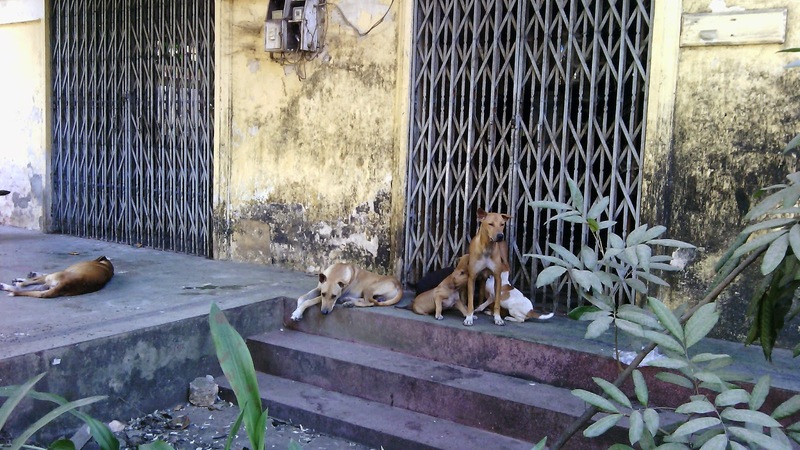 The dogs scrounge their food among the market stalls, they sleep on the street. They are not petted nor do they particularly want your attention. Two solitudes. Imagine my surprise when I saw a women coming out of a grocery store with food she had obviously bought for some dogs. They knew what was coming and were sitting in a row awaiting the treats. She talk to them, scolded one, and then give them each a bag of chips. What’s behind that? The vast majority of dogs here in Jamaica live a very similar existence - eating what they can, sleeping where they will, the females constantly carrying or with pups, and generally ignored. It's a genuine surprise to see a dog of any particular breed other than 'mid-sized medium brown mongrel.' They do seem very even tempered, and similarly left to their own devices. Jamaica is most definitely not a Buddhist country, though it does have a considerable 'live and let live' philosophy. . Sounds like the woman feeding the dogs has some misguided idea of what dogs might consider a treat.